Some dishes you set out to make and some you just stumble upon. This is one such recipe. I was trying to make Shrimp Biryani and was getting the gravy ready to reduce before I combine with the rice. Meanwhile, I call my husband to do a quick taste test to see if the spice levels are okay and he gives his thumbs up and says to me – how about we not combine it with rice and serve it with Roti or Rice on the side. I can tell he is REALLY hungry since he does not have the patience to wait 😉 but I think it is a good idea and I take it…. 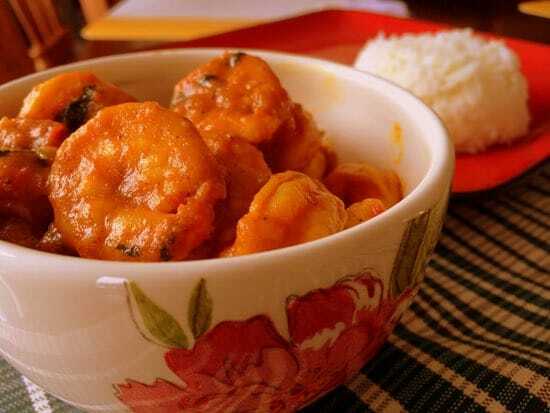 because I had not made Shrimp curry any other style other than Mangalorean (Shrimp / Prawn Gassi) before and also it turned out to be sooo yummy that I too couldn’t wait to get started! 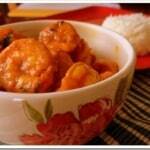 In a medium-sized kadhai or wok add 2 tablespoons of oil and keep it on medium heat. Add peppers, cloves and bay leaves and when they sizzle (after 10-15 seconds) add onions and garlic. Fry them till the onions turn translucent. Add the green chilies, red chili powder, salt, turmeric powder, and shrimp/prawns and mix well. Continue to keep it on medium heat till the shrimp/prawns are done. 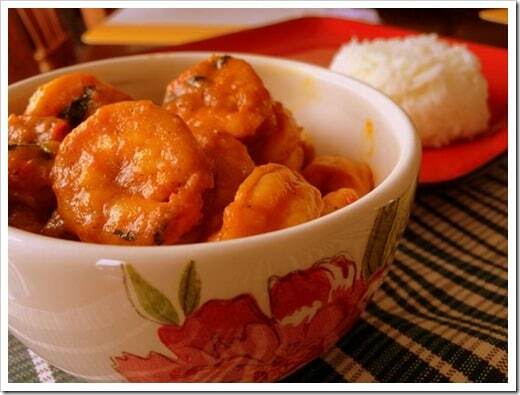 Garnish it with coriander leaves and serve hot with Rice or Rotis.